In an effort to decongest traffic and to construct a multi-tier parking in the main market, the district administration has shifted the taxi stand to the Bombguard area. The administration's decision is received well by most of the people, but has not gone down well with the taxi drivers. The present space occupied for the taxi stand in Leh town is being vacated as the Hill Council, Leh, will build a multi-tier parking project worth ₹ 27.84 cr, sanctioned in 2016 under the AMRUT scheme, for which work will commence shortly. It will have five levels to cater to the parking problem in Leh and will accommodate around 260 vehicles. Additionally, a land measuring 98 Kanals at Bombguard (within the municipality area) has been comprehensively divided and earmarked for parking of various taxis and other transport vehicles. While on the other hand, reacting to the decision, taxi officials said at least a space for about 60 -70 vehicles should be reserved for taxis in the parking as this would be convenient for the drivers and their clients. 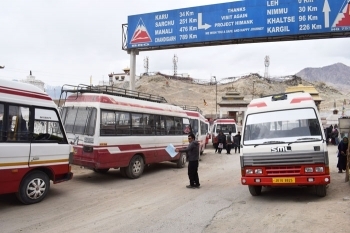 Angchuk Shali, Chairman, Ladakh Taxi Operator Cooperative Limited said," We have been requesting the administration to give us space for 60-70 cars in the new multi-tier parking, otherwise the public and the locals will suffer. As per their request, we have shifted to Bombguard. Another demand is that we should be given an office space in the main market as the present space provided to us by the administration is too small”. However, the administration has given instruction to park 10-12 taxis in the main market. All the remaining taxis can be parked at Bombguard and can come to the main market on demand basis. This crucial step of shifting of the unions will be instrumental in decongesting the main town area in the coming days, especially during summer season when Leh witnesses huge vehicular traffic. "Mostly everyone has shifted and there is a small issue with the taxi unions. They are asking for some space in the main city to park. We will examine that but at the same time their demand should not defeat our purpose," said the Deputy Commissioner. As an alternative solution, the district administration has decided to revive public transport as it was defunct for many years because there was no demand from the public. Around 60 buses are now scheduled to operate in and around Leh. Eight buses have been proposed for the airport and town, eight from the main market to Skazangling, two buses each to Spituk/Agling and Phyang, three for Chushot and eight buses have been proposed for Choglamsar, including two buses for Shey and Thiksay. Buses have the permission of ‘stage carriage’ while taxis have the permission of ‘contract carriage’. Lavasa says that licenses will be suspended for three months if contract carriage taxis are found to be operating as stage carriage. Promising better services to the public, he said that they would never let the public suffer. Now the onus lies on us and we have realised it as we have been through many problems. Earlier, there were around 150 buses but we had to sell them at a very low cost, at a great loss. Talking about their future plan, he said that they are planning to a make separate sitting arrangement for senior citizens, disabled and women and, if possible, will operate a separate bus for women and men. As an alternate arrangement, the Taxi Union is allowed to construct their office above the public toilet opposite Cooperative Bank and also allowed to utilise the open space for parking a limited number of taxis within the same compound. At present, various works are in progress at Bombguard that will cost ₹15.88 Lac. The construction of two community toilets will cost ₹.13 Lac each, in addition to the already constructed 4-5 single prefabricated toilets. The water supply scheme to connect the Bombguard area is in the pipeline and for immediate requirement, water supply through tanker service is being provided, and construction and surface dressing of internal roads within the Bombguard area at an estimated cost of ₹6Lac is also in progress. As a long-term measure, a comprehensive project with an estimated cost of ₹10 cr is being proposed to the Government of Jammu & Kashmir for funding. She said that the above-mentioned arrangement is made with a view to remove the traffic congestion and to resolve the parking problem in the town area. This step will also make Leh more tourist-friendly as well as make the town more convenient for the local people. Taking a strict stand on violation of rules, the Regional Transport Authority, Leh, has issued a notice on 8 March saying that instances had come to their notice that the contract carriage route permits issued under section 74 CMV Act are being violated by the taxis (Omni/Eccos) by operating their taxis as stage carriages, which is in contravention of section 66 CMV Act 1988, and also punishable under section 192 A for the first offence with a fine which may extend to₹ 5000 but not less than ₹ 2000 for the second and subsequent offences with imprisonment which may extend to one year or with fine which may extend to ₹10,000, but shall not be less than ₹ 5000, or with both. Strict checking will be conducted from March 9, 2018, by the authorities. If drivers are found carrying stage carriage passengers in contract carriage taxies, they are liable to punishment or cancellation of route permits of their taxies under section 86 CMV Act 1988. The new arrangement has eased congestion in most of the areas.